Opuntia polyacantha is a variable prickly pear cactus ranging from Mexico near CA, to TX, to the Rocky Mountain states and the Great Plains, and north into Alberta and Saskatchewan. This prickly pear cactus has been observed in dry areas in MN and MO. This Opuntia is more much more widely spread than the ubiquitous O. phaeacantha. concept of the taxon. Alternately, some varieties may some day be condensed with others. Fruits are dry at maturity; flowers are often yellow but may be orange, pink, or magenta. Seeds are large. Read the original description. O. polyacantha is tetraploid, but perhaps one or more other ploidies are represented in this large and diverse group of prickly pears. Other species have been treated as varieties of O. polyacantha including O. nicholii and O. trichophora (see Powell and Weedin). But these are treated as separate species herein because they are hexaploid or diploid, respectively. Opuntia polyacantha erinaceae has areoles that are usually large and relatively close together. The cladodes are typically very thick and often elongate. The plants tend to form upright clumps. They have many spines, usually mostly slender and terete. 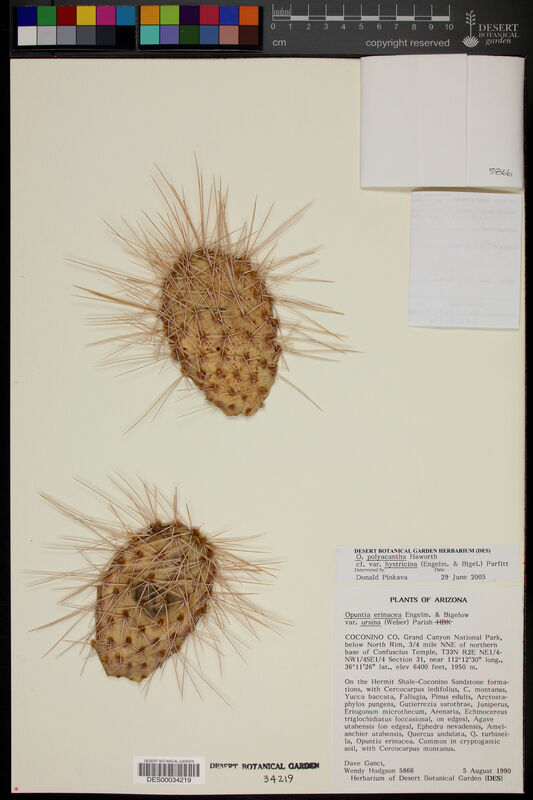 The spines can be stiff or hair-like, even on the same plant (some eastern populations of this prickly pear cactus have mostly plants with very thick stiff relatively short spines). The spines of this prickly pear cactus vary in color but are often light. The fruit is usually more elongate than in var polyacantha and often reddish when initially ripe (but soon fading to brown or tan as they dry). O. polyacantha erinacea is found in rocky areas (occasionally sandy areas) in the Mojave Desert and on hot rocky south slopes in the Great Basin Desert north almost to (or perhaps into) Idaho. It grows in hotter areas of canyons up the Colorado and San Juan Rivers into southern UT and almost to the Four Corners in AZ (it was mostly behind dam building and populations were destroy by reservoirs). This Opuntia variety grows in southeastern CA, NV, northern AZ, UT, and CO. Plants at high elevations in the Mojave Desert and southern California sometimes spread more than typical plants and sometimes are nearly spineless, whereas some plants at lower elevations may have enough spines to visually obscure the stem. Some botanists consider O. polyacantha var erinacea to be a separate cactus species, but we treat it as a variety of O. polyacantha herein, especially because it intergrades with, and readily interbreeds with, the other varieties. Opuntia polyacantha hystricina is very much like var erinacea, but the joints of this Opuntia are usually not so thick, and the plants are broader, lower, and more openly spreading in habit (as is the case for most O. polyacantha varieties). This prickly pear cactus is found in areas with at least a modicum of summer rainfall in cold winter deserts and in grasslands from eastern NV and southwestern UT to southwestern CO, central NM, and across most of northern AZ. Opuntia polyacantha juniperina is much like var polyacantha in many traits, but it has much fewer spines that are confined to the upper areoles or which may be nearly completely absent. The lower areoles of this Opuntia may have only one or two tiny spines or no spines. The fruit is often spineless or nearly so. This prickly pear cactus is found in mountainous areas of the Colorado Plateaus and Southern Rocky Mountains, but it is rare in the Front Range region. It is found in southern WY, CO, eastern UT, northern AZ, and northern and central NM. Similar groups of plants are scattered into ID and north into northern WY and in the Black Hills as well as the higher plateaus and mountain country of northern AZ. It is replaced to the west by var utahensis (the division is the north-south trending, central high plateaus and mountains of Utah). It usually grows in open conifer woodland, mountain scrub, or in areas of sagebrush. Opuntia polyacantha polyacantha forms a low spreading prickly pear cactus and usually has roundish pads (shape varies somewhat). The areoles are small and close together in this Opuntia. The spines are numerous with one stout, terete central spine that is is often 2 to 2.5 cm long (occasionally another one or two centrals may be present that are likely to be flattened). Several (to many) smaller spines radiate around the central central. Spine color is highly varied and has been the basis for several of synonymous names. Fruit of this prickly pear cactus tends to be roundish with short stout spines. It grows mostly in grasslands but occasionally into scrub and woodlands in mountains. It is found on the Great Plains and in the Rockies, from Alberta, Saskatchewan and MN southward to central NM, and the panhandles of TX and OK. This Opuntia has been reported IA and MO. It also occurs in southern ID and eastern UT. Similar plants grow in the Columbia Basin between the Blue Mountains and southern British Columbia that seem to represent this variety too; these may be westward continuations of populations in ID and MT. Opuntia polyacantha rhodantha has not been formally described as a variety of the O. polyacantha prickly pear cactus, but we treat it as one herein. It has areoles that are large and relatively far apart. Stem segments are usually very thick and may be elongate; they are generally “lumpy” because the areoles are prominent. Generally, cladodes are dark- or dull-waxy green. The spines of this Opuntia variety are stout, varied in color, and have annulate markings. The fruit has prominent (sometimes elevated) areoles that are relatively far apart, usually with stout short spines (but sometimes nearly spineless). This Opuntia is found mostly in desert in northern halves of Colorado Plateaus and Great Basin, lapping into Southern Rockies, Snake River Plains and Wyoming Basin. It also grows in UT, western CO, southwestern WY, southern ID, southeastern OR, and parts of eastern NV. Opuntia polyacantha schweriniana tends to be a miniature replica of vars polyacantha, juniperina, or hystricina–spination in this prickly pear cactus varies. It grows at high elevations (often above the other varieties) in the Southern Rocky Mountains in eastern UT, CO, northern NM, southern WY, with pockets of similar plants further north in WY and in the Black Hills. Also a few patches at high elevations occur in the San Juan drainage in northeastern AZ. See the original description (as O. schweriniana). Opuntia polyacantha utahensis has areoles that are relatively far apart. The cladodes are most often thickish and elongate, sometimes a bit lumpy (usually not), and light in color. The cladodes may be yellowish green and the spines are usually pale white to yellowish in color. The spines are slender. The areoles of this prickly pear cactus are relatively far apart on fruit and sometimes spineless. It is found mostly in lower mountains in woodland or scrub, but sometimes it occurs in sagebrush areas. It grows in eastern CA (rare), NV, western UT, and perhaps into southern ID and southeastern OR. Opuntia polyacantha is a widespread species found from Canada and the northern Midwest to California and down the backside of the coastal mountains into Mexico. Some plants don’t fit into the varieties we describe and are worthy of more study. 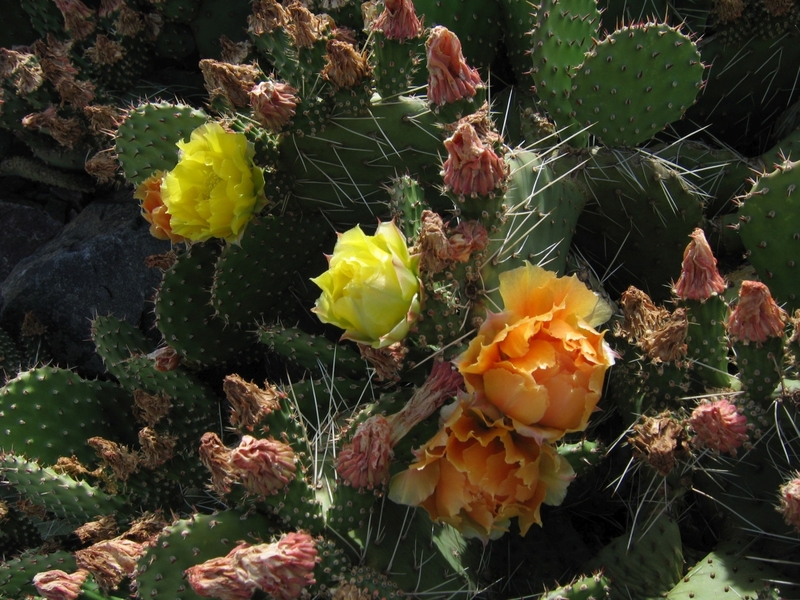 This prickly pear cactus is the most widespread Opuntia in the United states. There are many naturally occurring O. polyacantha plants with especially beautiful flowers. Also, many garden plants have been created by hybridization. Many vendors sell Opuntia hybrids, including Rainbow Farms. There are Facebook pages devoted to hybrids such as Flower Mountain. Or you may write to Derrill Pope at mokee007@aol.com.